Andes beorgas licgað andland eall Sūðamerican ƿesternum ecg. Þās beorgas sind Middangeardes langsta continental mountain range. Ungebrōcen is þis dūnland andlang Sūþamerican ƿesterne sǣrīme, 4,300 mīlalang, 120 mīla brād æt his brādestan betƿuh 18° sūþ and 20° sūþ be ƿoruldmēt), and mid hēanes in his medume ymbe 13,000 fōtum. Andes asprēadaþ þurh seofen rīcum: Fenesƿela, Colombia, Ecuador, Peru, Bolifia, Cile, and Argentina. Manig hēa ƿongas licgað on Andes þæm beorgum þæron standaþ micle byrig þærof sind Cƿuito, Bogotá, Arecƿuipa, Medellín, Sucre, Mérida, and La Paz. Altiplano se ƿong is Middangeardes hēasta ƿong æfter þæm Tibetiscan Ƿonge. Þās dūnfloccas þara Andesmunta sind in þrim miclum bedælunge þa sind þa Hātan Andes, þa Drigan Andes, and þa Ƿātan Andes. Andes þa dūnas sind þisse ƿorulde hēastan hlāƿas būton Asie. 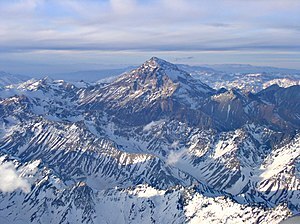 Hiera hēasta topp, Aconcagua Beorg, rīseþ to 22,841 fōtum ofer sǣs toefnesse. Chimborazo in Ecƿadores Andes is fyrðor fram Eorþe midlen þon ānig stede on his ƿlite. Man nīwanost wende þisne tramet on þǣre 03:00 tīde þæs 2 Ēastermōnaþ 2018.